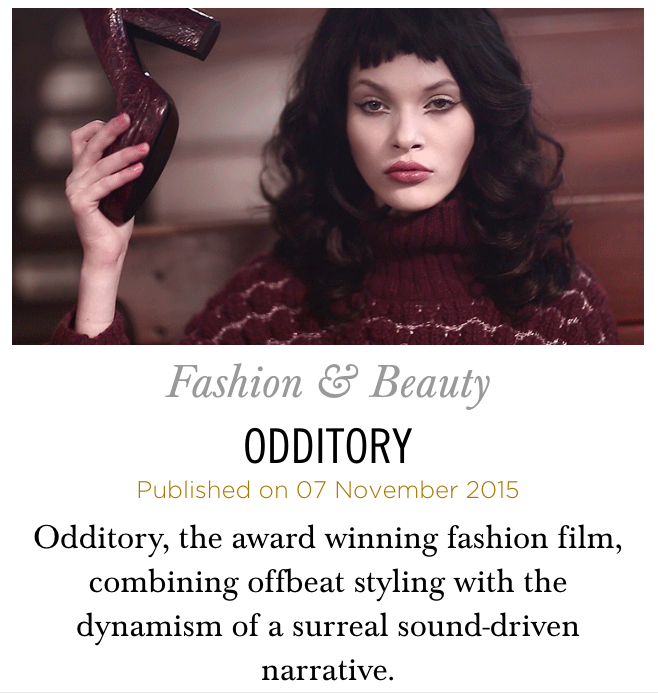 Monica Menez is the director behind Odditory, the short that won of Best Fashion Film at the 2013 Berlin Fashion Film Festival and is also now currently playing at the Aesthetica Film Festival this weekend. While Menez has definitely made her mark in the fashion industry with her films she is also a fashion photographer and it’s clear to see in her with the way she combines strong visuals and unique narratives. Today Hunger showcases Odditory that marries offbeat styling with the dynamism of a surreal sound-driven narrative. Where did the idea for Odditory come from and were there any specific influences from film, art, or photography that you had in mind while making the film? I used to have a storage room in an old schoolhouse. I was very impressed with the atmosphere of the building, so the idea of making a film here came up. In other words: The location was the basis for Odditory. Once the ambiance was set, I developed the concept by focusing on the colour scheme – which is usually the first thing I do when I start to work a new film. The whole setting in the schoolhouse had a retro touch. So I initially had a couple of pictures and ideas in mind, like muted colours, turtleneck sweaters, and so on. It is very important to me that the scenery, the colours and the clothes match perfectly. Can you describe some of the obstacles you faced shooting Odditory and how you overcame them? There was actually one huge problem that we were facing while shooting the film: It was freezing cold! The building was not heated, and the few radiant heaters were not of much help. Your shorts have been very successful at fashion film festivals picking up a bevy of awards. Do you feel pressure to deliver on your next fashion film? I actually do feel some kind of pressure. A lot has to do with my own expectations on a new project. I am always concerned if I can implement a new idea, and if everything will turn out the way I want it to be. Of course I want people to like my new film, but primarily I have to be satisfied with my work. What initially interested you in fashion and when did you decide to marry this interest with filmmaking? I was interested in fashion ever since I was a child but not in the sense that I was a fashion victim who wanted to look like everybody else. I always had my own style. At the age of ten I was walking around in high-heels, shortly afterwards I had a phase in which I was solely wearing dotted clothes – from top to toe! Then as now I want to represent my own ideas and visions of fashion. The reason why I started making fashion films was rather coincidental: while I was working on Precious – which was still a photo project at that time – I realised that it was hard to express the story I wanted to tell by means of photography. In order to finish the project, I had the idea of filming the scenes. I enjoyed the final result so much that I decided to continue my work in this field. I really enjoy directing! Nevertheless, I will continue my photographic work. What do you think is the biggest misconception about fashion films? A fashion film should not be confused with a commercial, since these are two completely different things. A fashion film is supposed to be entertaining and inspiring, and not to be a filmic advertisement for a label. What do you have planned next? Any exciting projects? I am currently working on a new film. I have just finalised the storyboard, now I start planning the décor and the furnishings. Then there are two other projects that I cannot really speak about at the moment, but let me put it this way: 2016 will be an exciting year! For more information on Monica Menez and her projects visit her website.